This year, we are introducing the concept of the CATs TrailFest for our late October event at the Miller School of Albemarle. The CATs TrailFest will be comprised of the 5th Annual CATHalf Trail Half Marathon, the 2nd Annual Pounding Creek Trail Marathon, and a new 10K Trail run! As usual, the races will be run on the beautiful campus of The Miller School of Albemarle. The courses feature challenging climbs, miles of sweet single-track trails, and spectacular vistas of the Blue Ridge mountains. Don’t miss your opportunity to experience these unique trails by registering for one of the races now. 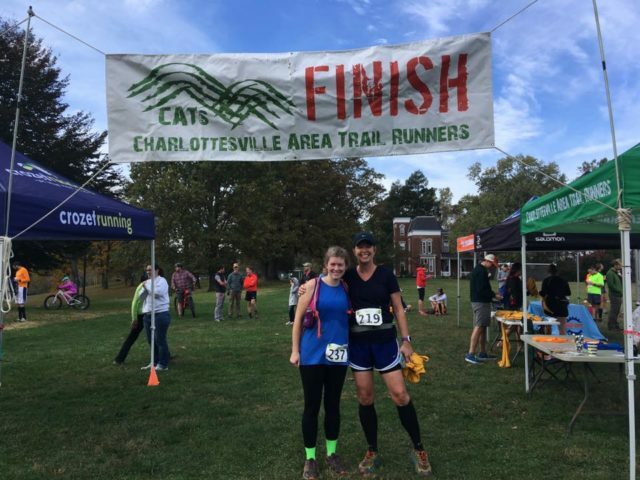 This year, we also have a new Race Director to oversee the CATs Trailfest: Emily Hatch from Charlottesville Multisports (CMS). Emily has agreed to volunteer her time to RD this race and we are using a CATs Trailfest page on the CMS website as a gateway to register for the race. The CATHalf is a one-loop half-marathon with over 2500′ of vertical climbing. The Pounding Creek Marathon adds a second loop of the half-marathon course. The 10-K will race will provide a shorter, but no less breathtaking experience on the Miller School Trails. The three races will feature staggered starts on Saturday, October 26th, 2019, beginning at 8 am. Prizes will be awarded to top finishers, age group winners, as well as random runners in each race and, of course, there will be a fun and festive party at the race finish! The trails are maintained by students on the Miller School of Albemarle Endurance Team and we organize this race together with the MSA Endurance Team coach, Andy Guptill. A significant portion of the proceeds benefit the MSA Endurance Team. All finishers will receive a Patagonia Capilene Long Sleeve technical running shirt at the finish line. Sweet! There will be prizes for top finishers and age group winners. We also have fun prizes and swag to give away randomly! Hang around for the fun finish line party! We will have Krispy Kreme donuts, Bodo’s Bagels, coffee, grilled cheese, soup, and other foods at the finish line. Stay for the party! The course is awesome – but tough! The CATHalf is one loop, the Pounding Creek Marathon adds a second time around the loop in the same direction. The 10K course will follow a segment of the loop, but cut back earlier. * Runners can expect mostly rolling wooded single track, with periods of field running and a little time on gravel roads. While there are no HUGE long climbs, there is a lot of climbing and descending in small bites throughout the race (see elevation profile above) with a total amount of climbing of ~2500 feet per loop. Pace yourselves, this course will wear you down and beat you up! – Marathon runners must your their first loop (i.e., the half marathon) in 3.5 hours. – Cutoffs at 2nd loop aid stations if you don’t appear to be on pace to finish in 7 hours, are as follows: Puke Hill/Burke @ 14.7 miles: 4 hrs, Upper Meadows @ 18.6: 5 hrs, Upper Meadows @ 20.4: 5:30 hrs, Puke Hill/Burk @23.1: 6hrs 10 mins. Judgements to pull somebody that do not make a cut-off will be made by aid station volunteers based on how runner looks and feels, if runners are falling way off pace, weather, etc. There will be two aid stations on the course per loop. There will also be an aid station at Mile 13.1 (start/finish). The mileage on the aid stations is as follows, roughly: 1.6 (Puke Hill/Burke Run), 5.5 (Upper Meadows AS), 7.0 (Upper Meadows AS), 10.0 (Puke Hill/Burke Run), and 13.1 (Start/Finish). Aid stations will have water, sports drink, and a few trail race classics such as soda, M&Ms, Gummy Bears, and chips. We may also have gels, but please be sure to bring your own favorite if you prefer to fuel with gels. We suggest carrying handheld water bottles or a hydration pack in order to limit your cup usage on the course as well as to make hydrating easier between aid stations. *Stay tuned for a map containing the 10K route and cut-back! Google map location is here. Ample parking in field to left of main school buildings. I have always wished for a local trails half !! Thank you !! Looking forward to it ! Great! It’s going to be a fun event! So glad to be able to participate this year. I signed up for the Training Program – but can help if needed. Is there a price bump and/or t-shirt deadline? If I register tomorrow, can I still get a shirt? Yes you will still get a shirt. Would you mind posting a picture of the t-shirt? It’ll be this Patagonia shirt with a cathalf pocket logo. Hi! I registered for the half last weekend but never received a confirmation email. Its highly possible I messed up me email when registering!! I did get a charge for race it, so just wanted to make sure everything was okay! Yes I do have your registration on file. I going to resend you the confirmation email. you guys doing this race in 2017? i’m looking for a close 1/2 trail. Yes we are! It will be on the same weekend. Last Saturday in October. Looking forward to have you! Registration will probably open in July. I recall hearing that a full trail marathon might be offered in 2017. That would be great! My question today is has a date been set for the 2017 event. I have friends who would like to plan their flights etc. Thanks for any information. What is the registration deadline for the 2017 CAT Half? We typically close online registration the day before the event. If you want to get a guarantee for a finisher shirt however you may want to register until 4 weeks before. Hello, I was wondering what the time cut-off will be for the half-marathon? The CATHalf has no official cut-offs. You may power-hike the whole thing if you want. We just want everybody to have a good time in the woods. There won’t be chip timing.